Movie screening in a cinema in China. Talk about a "golden" week for China's film industry. 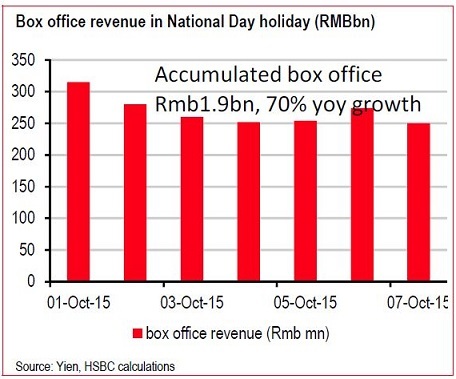 The country's box office revenue totaled an estimated 1.9 billion yuan ($299 billion) during the October 1-7 National Day or Golden Week holidays – a near 70 percent growth on year, according to calculations by HSBC. The key driver of the growth is high quality domestic films, says John Liu, analyst at HSBC, citing comedies 'Goodbye Mr. Loser' - the story of a middle-aged 'loser' who finds himself magically transported back to his high school years to fix his life's mistakes - and 'Lost in Hong Kong,' described as a Chinese crossover between the Hangover series and Due Date. The performance of the movie sector reflects both its resilience to slowing economic growth and shifting consumption patterns in China, with consumers looking to spend more on experiences than products. "We think the China film industry will continue to beat expectations regardless of the macro-economic outlook," he said. "We note there was a high box office revenue growth rate during the financial crisis in 2008-2009." Read MoreIs there really money to be made in Chinese movies? China is home to the world's second largest film market outside the U.S. in terms of box office revenues. There are more than 5,660 cinemas and some 28,000 screens serving China's 1.36 billion population, according to State Administration of Press, Publication, Radio, Film and Television (SARFT). An estimated 15 new screens open daily in China, Bloomberg reported. China's box office collections totaled over 20 billion yuan in the first half of 2015, with foreign films raking in a total of 10.8 billion yuan, compared to domestic films, which grossed 9.5 billion yuan , according to SARFT. "We believe the entire film value chain will benefit from the booming market, including content producers, distributors, cinema lines (which operate the theaters) and movie theaters," said Liu, who's top stock pick in the space is Shenzhen-listed media group Huace Film & TV, which is involved in the production and distribution of films and TV dramas.